Fair Winds Press, 9781592337729, 232pp. Cody Johnson is an intrepid psychonaut and humanist who writes about mind-expanding plants and compounds at PsychedelicFrontier.com. His first taste of psychedelia came in the form of MDMA, which opened him up to the vast realm of unexplored states of consciousness. He dove head first into this new world, experimenting with dozens of psychedelics new and old while blogging about all things psychedelic: their history, emerging scientific research, therapeutic and spiritual applications, and legality. Magic Medicine takes us on a journey into the most controversial and mysterious of medicines: the mind altering plants and chemicals responsible for some of our greatest visionary creativity and also our paranoid delusions. Cody Johnson does a great job at separating fact from fiction in this eye-opening book. Magic Medicine is a wonderful object as well as a valuable text on this essential subject. Johnson describes a wide range of psychedelic substances - their effects, history and contemporary uses - in a readable style of prose and set amidst an alluring and beautifully presented format. Highly recommended! This is a delightful book that takes the reader on a pleasurable trip through several millennia of use and reflections on humans use of psychedelics. It is beautifully researched and pleasingly produced, with a satisfying balance of science, history and insights. I am sure that everyone interested in this growing field will find something new to intrigue and hopefully inspire them. 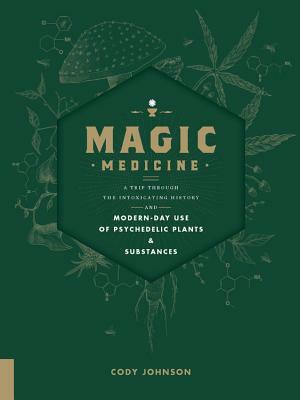 Magic Medicine is an entertaining, up-to-date encyclopedia of the ineffable, offering easy-to-digest insight into a dizzying array of psychoactive drugs and sacred plant medicines. What a good book this is! A rarity among psychedelic publications, it is straightforward, useful, makes complex biochemistry understandable, and will be a reference for years to come. It is a drug-by-drug series of clear, useful descriptions of just what you need to know about both synthetic and plant-based psychedelics. I thought I knew all this stuff, but Johnson weaves in excellent scholarship and some wonderful stories that surprised and delighted me as well.